I feel like the The Most Interesting Man when I say, "I don't shoot with a tripod often, but when I do, I keep it light." And even though I don't have the rugged good looks of the Dos Equis guy, I know what I want when it comes to photography... even if I have to make it myself. My current rig for high resolution capture is the Olympus OM-D E-M5 with its 40MP capture mode, using the new ECG-2 External Metal Grip with built-in Arca Swiss compatible plate. 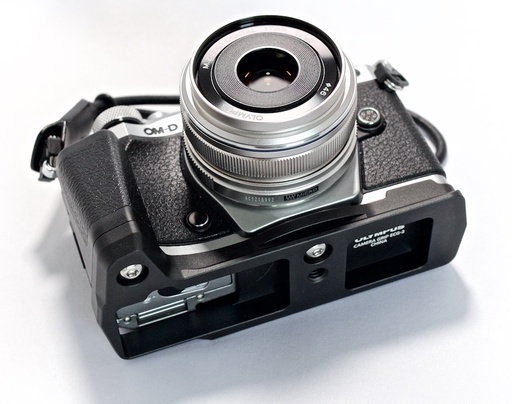 Olympus OM-D E-M5 II with 17mm f/1.8 lens and ECG-2 grip with built-in Arca Swiss compatible plate. Notice that the grip also provides access to the battery compartment. I then add a MeFOTO DayTrip Tripod, which is only 9.4" tall when folded, and substitute the Joby Ballhead X, which I think is a great value in Arca Swiss compatible tripod heads. I also like that Bullhead X has a panning function (via a second knob) that's great for panoramas. MeFOTO DayTrip with Joby Bullhead X. I don't need to bring its adapter plate if I'm using the ECG-2 grip. When I want to shoot a panorama, HDR, or high resolution shot with the E-M5 II, I simply slide the camera into the Bullhead X, tighten the knob, and start shooting. 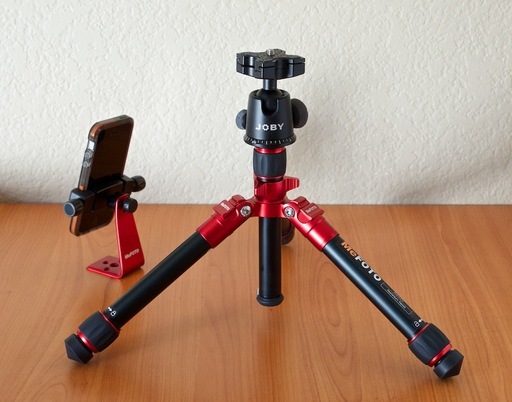 The tripod, head, and camera bracket weigh less than 3 pounds, are super compact, and very fast and convenient to use. The FrankenPod has a high Nimbleosity Rating. What does that mean? You can learn about Nimbleosity and more by visiting TheNimblePhotographer.com.